If you can’t make it to a class or are just curious about long-term care insurance. Take some time to read through this page. It is designed to walk you through the 10,000ft overview of long-term care planning. Putting a plan in place isn’t simply about getting a quote. 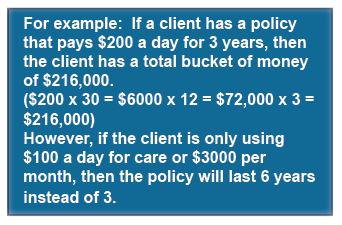 (You can find some ideas of the costs on our Examples page) We start with education so that when you are ready to work with us to design your custom plan, you have a foundation of knowledge on how long-term care insurance works and the different types of plans. You can learn more about our process HERE. Generally, long-term care refers to the assistance that a person needs throughout the day when their health is compromised. It includes skilled and unskilled care, occupational therapy, and general custodial care including housekeeping chores, meal preparation, bathing, dressing, eating and transferring. The Odds are Stacked Against You! 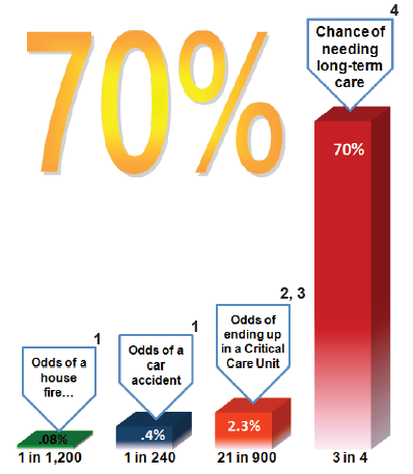 According to the US Department of Health and Human Services, once you reach the age of 65, there is a 70% chance you will use some form of long-term care during your life. 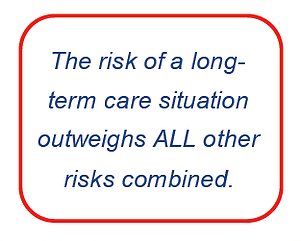 In fact, long-term care is the largest single risk you face during your retirement years. Not only does it have the potential to be a devastating financial burden, it also can put a physical and emotional burden on the people you care about most. Cognitive claims are the fastest growing area for long-term care and comprise over 40% of all new claims. How is Long-Term Care Different from Traditional Medical Care? Medical care as we know it is for acute care with a goal of curing us of an illness or fixing us and getting us back to normal. The goal of long-term care is not to cure an illness, but to allow us to attain and maintain an optimal level of functioning. Long-term care encompasses a wide array of medical, social, personal and specialized housing services needed by individuals who have lost some capacity for self care. Individuals who require long-term care are generally not sick in the traditional medical sense. They do however require assistance to perform the activities of daily living or supervision due to cognitive impairment. There are only two ways to pay for the additional costs that come with a long-term care situation. Private pay, which is self-insuring. 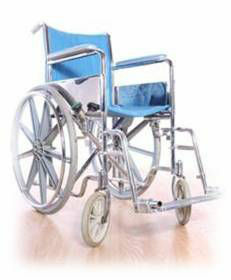 Long-term care insurance which transfers the cost to a private insurance company. What about Medicare, Medicaid and the VA? Medicare Part A (Hospital Insurance) and/or Medicare Part B (Medical Insurance) is for acute care and does not cover long-term care. It covers eligible home health services such as intermittent skilled nursing care, physical therapy, speech therapy and occupational services. Medicare does not pay for 24-hour care or custodial care (meals, homemaker or personal services). Medicare may pay up to 100 days of skilled nursing care after an eligible 3-day hospital stay. The first 20 days have a $0 deductible and days 21-100 require a deductible of $161.00 per day. You can learn more about Medicare coverage at www.Medicare.gov. Medicaid is an entitlement program designed to provide care for the poor. In order to qualify for long-term care assistance a person must be devoid of any meaningful assets or income. 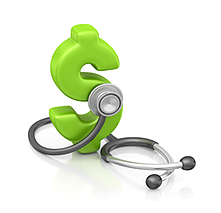 This means to qualify for Medicaid, you must spend through your savings and assets down to the state required level. When you qualify for Medicaid, you become a ward of the State and they will dictate the location and level of care you receive. Learn more at www.Medicaid.gov. VA Benefits are available for some long-term care situations for Veterans and in some cases, their surviving spouse. However, much like Medicaid, VA benefits provided for long-term care are for those who meet certain need requirements based on income and assets. You can read more about available VA Benefits for long-term care at www.VA.gov. Long-term care insurance provides a tax-free stream of income to help pay for care costs that are not generally covered by medical insurance, Medicare or Medicaid. Home, adult day care, assisted living facilities, nursing homes, hospice care, special care facilities and adult family homes. 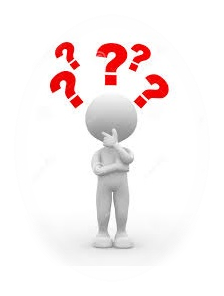 What Triggers a Long-Term Care Claim? How is Long-Term Care Paid Out? 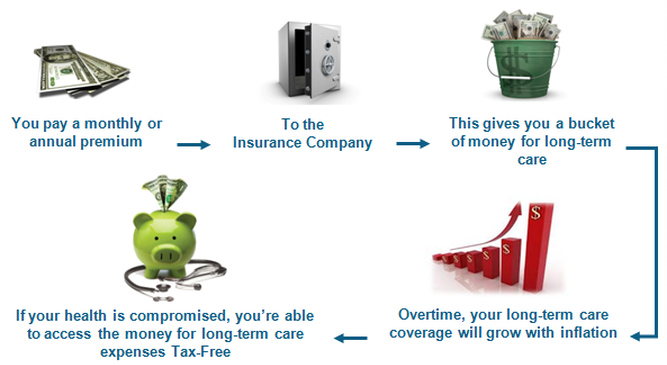 Think of long-term care insurance as a bucket of money that you can access to pay for care when needed. 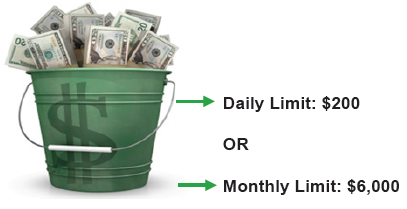 Most policies will reimburse you up to a set rate based on either a daily amount or a monthly amount. Any unspent money remains in the policy for future use. Many policies describe a term such as three years of coverage. However, that simply describes the minimum amount of time the policy will last if you are pulling out the maximum amount of money from your policy. Stay in your own home for as long as possible and avoid nursing home care. Protect your family and not become a burden on loved ones. Stay in control of your care options and avoid becoming a ward of the State. Avoid liquidating assets and paying unnecessary taxes. Traditionally long-term care planning has been aimed at the middle class who are at risk of losing their savings from an extended health care situation. Due to new programs and recent changes at the state and federal level, long-term care is benefiting a wider range of individuals from smaller estates up to the wealthy who have traditionally self insured. New programs have also made it easier for older adults to qualify for plans, and some of the newer plans also accept people who may have been turned down in the past due to medical conditions. Today many plans accept people up to age 80 and some alternative plans will go up to age 90. All plans require some type of medical underwriting, meaning the insurance company is looking at your overall health before they will agree to insure you. Health is a key factor in qualifying and age is also a factor. The younger you are when you put your plan in place, the more coverage you will get for the same investment. Younger applicants also have many more plans and options to choose from. There is no advantage in waiting. Nationally, one in three people who apply for traditional long-term care insurance are turned down. Many people are one doctor visit away from becoming ineligible for long-term care insurance coverage and once you are turned down, it can be difficult to find a company who will accept your application. NAIC – National Association of Insurance Commissioners has set new guidelines which all the states have adopted as of 2012. This means all long-term care insurance policies must meet the new standards which include standardizing the claims process, policy trigger definitions and home health care options. The NAIC is also working on bringing transparency and limits on premium increases for traditional long-term care insurance plans. The State Partnership Program is a partnership between Medicaid and the private insurance companies who write long-term care contracts. It rewards individuals who purchase a traditional long-term care insurance policy by allowing them to qualify for Medicaid should they need it without spending through all theirassets and savings. It will allow an individual to keep one dollar of assets for each dollar the insurance company pays on their behalf for long-term care. Partnership plans benefit people who may not have considered coverage in the past due to lack of resources.Partnership plans only work with qualifying traditional long-term care insurance plans. Example: Mary has a qualifying State Partnership long-term care insurance plan. Her health becomes compromised and she goes on claim and starts receiving benefits. After several years her policy has paid out $225,000 for care and the policy is exhausted. Mary still needs care so she applies for Medicaid. Mary is now able to keep an additional amount of assets equal to $225,000 and qualify for Medicaid. Note: Without this plan, Mary would have to spend her assets down to $2,000 in the State of Washington to qualify for Medicaid. The Pension Protection Act went into effect in 2010 and greatly changed the way long-term care insurance plans can be set up and funded. The biggest change it made was to remove the IRS and unwanted tax consequences from Asset Based long-term care plans. Because of these rule changes, many new programs have been developed that allow clients to set up and fund long-term care insurance plans without risk of losing money or having to pay taxes on the leverage and growth of the policies. This new law has had the single greatest impact on long-term care plans and has made self insuring obsolete for even the wealthiest of clients. Although these plans are the “old” way of insuring, they are still new compared to the plans that were sold to your grandparents. These plans are new in the way that they have all been updated so they comply with the new NAIC standards for long-term care plans. This means that now te policies clearly define how they can be triggered and what they cover. 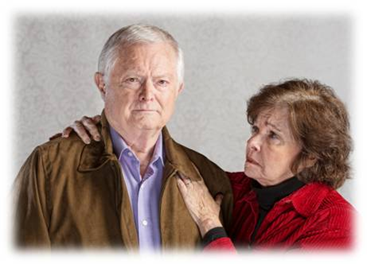 Someone who doesn’t want to risk spending through their savings for a long-term care situation. Someone who would like to protect Assets from Medicaid Spend-Down requirements. If you want to pay into their plan on a monthly or annual basis. Someone who may be considering giving away their assets or setting up a trust to qualify for Medicaid. Asset Based long-term care plans have been around since the late 1980’s but became the fasted growing type of policy after passage of the Pension Protection Act. These plans, along with the Hybrid plans are now the new standard in long-term care planning because they pay you back if you never need care. Someone wants to set up a plan that is guaranteed to pay them back if they never use it or cancel the plan. 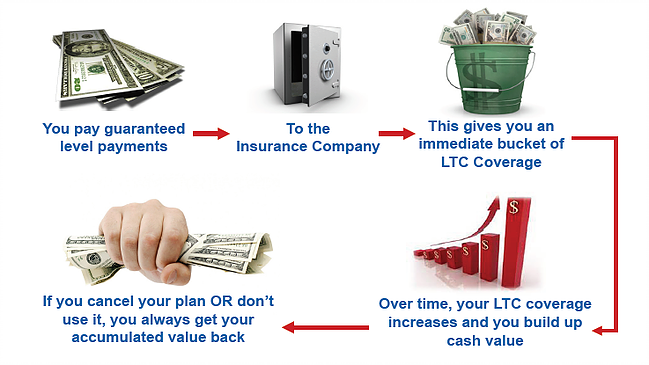 Someone who wants to fund a plan with a single payment or with guaranteed level payments. Someone who does not want to pay unnecessary taxes by converting assets to income to pay for care. Hybrid Plans work like Asset Based plans but are paid into over time with Guaranteed level premiums that will never increase. 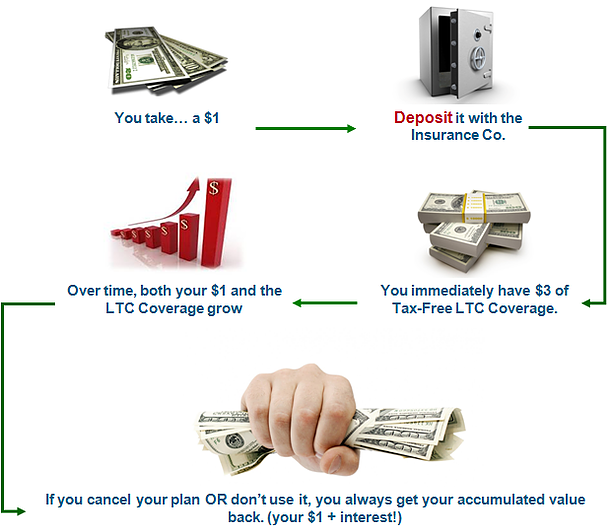 Someone who wants to fund a plan with guaranteed level payments. Critical care insurance started in South Africa in 1983 and was initially called Dread Disease Insurance. It was designed as a way to compensate individuals who suffered from a major or critical illness. Today it is known as cancer, heart attack or stroke insurance and has many unique features. Critical care insurance is useful as gap insurance for younger working age adults as it can provide a lump sum of money which can be used for additional treatments not covered by traditional medical insurance or to pay ongoing costs like living expenses. Due to its less strict underwriting, it can be considered as a substitute for long-term care insurance for those who cannot qualify for a traditional policy. 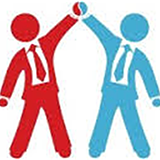 Younger individuals that are still working. Someone who cannot qualify for a long-term care insurance plan. Someone who wants to supplement their health insurance benefits. Life insurance has evolved to compete with long-term care insurance by offering riders which allow a person to accelerate the death benefit to pay for long-term care costs. These riders are usually listed as Critical Care Riders or Chronic Care Riders and will vary depending on the insurance company offering them. Triggers may also vary and many riders require an individual to prove they are going to need long-term care services for the foreseeable future. Although these plans can provide a meaningful benefit, you need to be aware that many plans do not meet the NAIC guidelines for long-term care insurance and may be more limited in benefits and more difficult to file a claim. Many annuities are offering additional benefits to cover long-term care. For example: a fixed annuity may offer to double the income payment if you end up in assisted living or triple the income payment if you end up in a nursing home. However, these plans generally do not meet the NAIC guidelines for long-term care and the claims process is determined by the individual company. Although these plans may have some benefits, it is hard to depend on them for long-term care as they all have different qualifying procedures. Before considering using an annuity, make sure you check with other options to compare coverage and trigger rules of the plans. Immediate care plans are offered to those who are already receiving care. Issue age is generally between 75-99 but is not limited by age. Immediate care plans use reverse medical underwriting to provide a higher monthly benefit based on a single premium payment. The worse the health of the individual, the higher the payout will be. Immediate care plans are used to limit the drain on an estate when an individual is already in a long-term care or crisis situation. These plans can also provide tax advantages when compared to paying for care directly out of savings or investments.